Protecting Tomatoes From Dread Diseases | Gardens Alive! 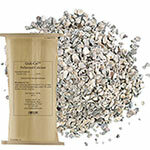 Quik-Cal™ Pelletized Calcium - 5 lb. Both of these wilts (verticillium is more common in cooler climes; fusarium where its warmer) lurk in soil where tomatoes (and some say their relatives—spuds, peppers and eggplant) have grown in seasons past. They can persist in a plot for 15 years (! ), but generally die out if you don't plant those garden favorites in the infected area for four seasons or so. 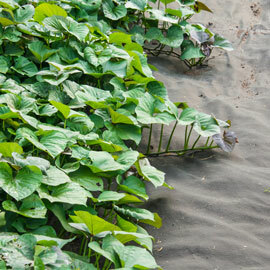 Morning sun, good drainage, high levels of organic matter in your soil and lots of airflow around the plants are all helpful in controlling the problem; chemical fertilizers are NOT—the fast, weak growth they cause is prone to such disease. So, if you MUST grow your love apples in the same areas as seasons before, be prepared. If they're already in the ground, check them carefully, remove all diseased parts, clean up around the base of the plants, then mulch the surface of the soil with the highest quality compost you can find—an inch deep and a couple of feet out in all directions. Living organisms in the compost will actually eat the disease spores. Yum. 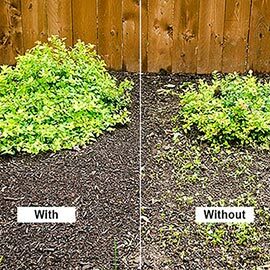 Then be vigilant—pull off discolored leaves as soon as they start to look funky, and remove the old compost and reapply a fresh inch every month. Spray the plants weekly—either with a natural fungicide, compost tea (home made or one of the super-charged compost teas being brewed at larger garden centers) or The Cornell Formula: A table spoon each of baking soda and vegetable or horticultural oil, plus two drops of dish washing soap, in a gallon of water. Be sure to remove discolored leaves first, only spray first thing in the morning and really soak the undersides of the leaves. If your love apples are not yet in the ground, try and find a new space to plant them in. Or plant at least a few in big containers that are totally free of ANY garden soil. Use a high-quality, organic potting soil containing compost or other natural fertilizers; or my famous mix of equal parts peat, perlite and compost with a tablespoon of lime or wood ash to adjust the pH. If the containers do great and the dirt does not, there's your answer. In future seasons, seek out disease resistant varieties; they'll have "VF" (the initials of those wilts) and probably a few other letters, like N for root knot nematodes and T for Tobacco mosaic virus, after their name. Or try some of the huge, fast-growing heirloom varieties like the super-tasty Brandywine; these rangy vines often grow so fast they can 'outrun' disease! And remember— these wilts generally only harm the leaves of your plants; the actual tomatoes tend to be unaffected, and are always perfectly safe to eat. 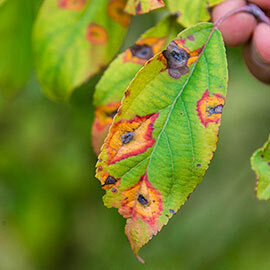 True blight is a rarer and MUCH more serious problem. If blight it be, cry. Then do everything we've said and to do it perfectly: Have LOTS of room between plants; put every tomato where it gets morning sun, remove diseased leaves the second they show their spots; have a heavy hand with the compost; and alternate weekly sprays between the three disease preventers we just mentioned. Oh, and maybe try the variety "Legend" next year; it's the only tomato I know that claims to be resistant to early and late blight. Make sure you add eggshells to your planting holes! Later this season I'll get tons of emails from people who want to know what disease is making their tomatoes turn black and rot down at the bottom. That's no disease—that's blossom end rot, and it's caused by too much water, too little water, or just plain uneven watering. Once you get to the rotten bottom point, there's no real cure—but you can prevent it now. With eggshells. That's right—eggshells First of all, I hope you all know to plant your tomatoes deeper than other garden plants. Tomatoes form auxiliary roots along their buried stems, allowing them to take up more food and water and anchoring them better in the ground. If you've got a foot tall start, remove the bottom leaves and bury 8 or 9 inches of the stem BELOW ground. And add the dried, crushed shells of a dozen eggs to that planting hole. The calcium they provide will allow your tomatoes to regulate their water needs so well, they simply can't get blossom end rot. And they'll taste better too! MUCH better! The flavor of tomatoes comes mostly from volatile aromatic oils that we perceive not with our taste buds, but with our noses. And tomatoes NEED calcium to produce those oils. So if you haven't been adding eggshells and think your tomatoes taste great, wait till you see the improvement calcium can make—you'll never go eggshell free again. Now, if your tomatoes are already in the ground, don't panic. If you didn't bury them deep in that wonderful heavy clay of yours to begin with, dig 'em up and do it again—this time, nice and deep, with a dozen eggshells and a handful of compost in the hole for good luck. Do this in the evening, water well afterwards and again the next morning and they'll be like 5 year olds being carried in asleep from the car; they'll just wake up in bed the next morning with no idea anything happened. And if you did everything right except the shells (or are in a blind panic trying to figure out where to get enough eggshells right now) use a calcium-rich organic fertilizer instead. Just be sure and check packages or product descriptions carefully; even though almost all our soils are deficient in calcium and plants need it, a lot of fertilizers don't contain it.